Boston Marathon weekend in the city is filled with energy and pride! There’s a lot happening all around town and this guide is filled with special deals, discounts, specialties, where to eat and drink, street closings and volunteer opportunies in the neighborhood! Row 34 will be getting in on the carbo-loading-palooza. On April 15th from 5:00-10:00pm, enjoy three different pasta options like kale bucatini with clams, green garlic and pistachio or garganelli with tuna bolognese and pecorino. Executive Chef Steve Brocone is hosting a Pasta Dinner on Sunday night at Coppersmith for those running the marathon as well as guests just looking to carbo load before the big day. Specials will include Fettuccine aglio e olio, Ricotta stuffed Manicotti with Grandma’s red sauce and Penne with sweet fennel sausage, red pepper and broccolini. Pasta dinner specials will be available in addition to the regular menu. Reservations are highly recommended. Tuscan Kitchen Seaport is offering an amazing deal for all marathon runners. ALL weekend long (April 14-16th), marathon runners who show their registration (the marathon app is acceptable) will receive a complimentary meal of some of Joe Faro’s favorite pasta dishes including Spagettini Pomodoro with Grilled Organic Chicken Breast / Roasted Broccolini, Tagliatelle Bolognesse with Classic Braised Sauce of Beef, Veal & Pork, Parmiggiano Reggiano and Ricotta Gnocchi with San Marzano Tomato, Basil Pesto, Garlic Spinach! Yotel is getting in the Marathon spirit! Boston 26.2 Brew, the official marathon beer, on tap at both Sky Lounge (rooftop bar) & Club Lounge (lobby bar) through Marathon Monday! Special Marathon Breakfast menu, available Friday-Monday in Club Lounge: Yotel Blueberry Protein Smoothie $5, Superfood Boosted French Toast $15 cinnamon, chia seeds, lemon ricotta, blueberries, Vermont maple syrup; Quinoa & Egg Scramble Runners Bowl $10 add a little extra – avocado, bacon, home fries, breakfast sausage ($4) and Pre-Marathon carbo loading bowl available Sunday 4/15 in Club Lounge: FORT POINT HEALTHY CARB UP BOWL $16 quinoa, lentils, kale, dried cranberries, roasted sunflower seeds, broccoli florets pomegranate vinaigrette. Last but not least, a Special Marathon cocktail available is available Friday through Monday! Shakeout run! Lulu Lemon in the Seaport and Ciele Athletics are hosting a pre-race fun run on Saturday at 3pm! Participate in the Shakeout run and an after party featuring Mystic Brewery and appetizers by Tuscan Kitchen. You can register for it here! East Side Yoga and Fitness is hosting a weekend worth of workouts plus flash sale and class! Friday, April 13th thru Wednesday, April 18th -bring your marathon bib in for a FREE class! Saturday, April 14th – 9:45 am – Yoga for Athletes with Lisa, open to all, geared towards anyone running the marathon. Monday, April 16th – Flash Sale – 5 Pack Online Only Sale – $70, expires in 60 days / One day only! And on Monday a Flash Class – Yoga Sculpt with Andrea, 9:00-10:00 am – $15 cash drop in only (packs/monthly/unlimited memberships do not count)! If wading though the throngs of marathon on-lookers in the Back Bay isn’t how you’re looking to spend your Patriots Day, Kings Seaport offers an escape away from the crowds. Perfect for marathon viewing, Kings’ new Seaport location’s revamped bar and modern gastro-sports pub concept, The Draft Room, features three impressive stadium quality 12-foot HD LED screens, multiple HDTVs, over 40 beers on tap, and a 160-person capacity. It’s 100% made-from-scratch menu features pizzas, burgers, wings, nachos, giant beer mugs, and shareable, large-format drinks. Kings,Seaport will also be serving up Sam Adams’ 26.2 on tap. Recover after the Marathon on Tuesday, April 17th at Shredded! 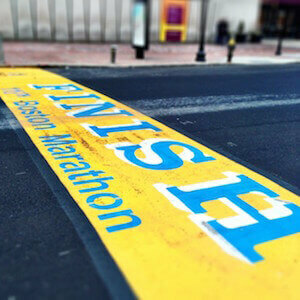 Bring in your Boston Marathon Bib and enjoy a delicious salad or bowl for 26.2% off! Sweet! Wondering about traffic, where to park and what streets will be closed? The City of Boston has some handy information you can read! How to Bike in Boston Without Everyone Hating You: A guide.